Note: You can hide the upper part of the header containing the top blue bar, the New button and the left action bar. 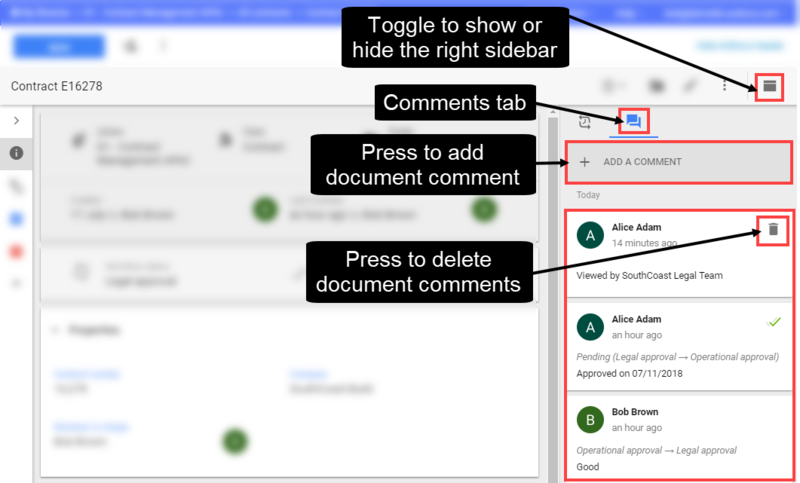 Share: You can manage the sharing permissions at the document level. Administrators can prevent contributors from sharing a document. 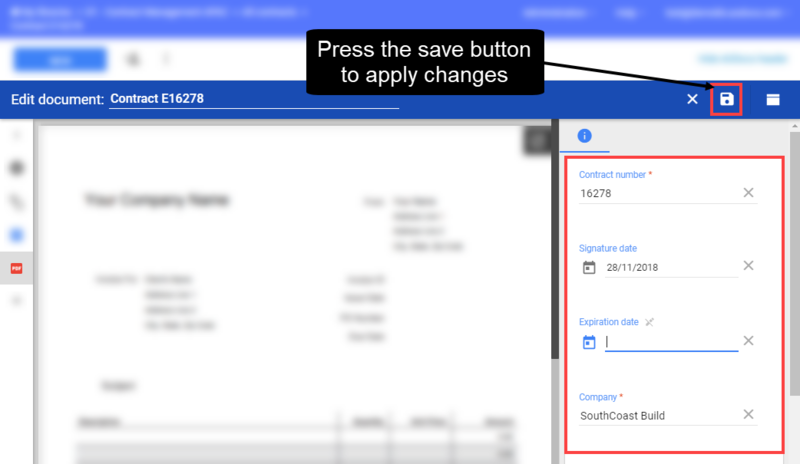 More Actions menu containing the option Document history: You can access the activity log of a document. 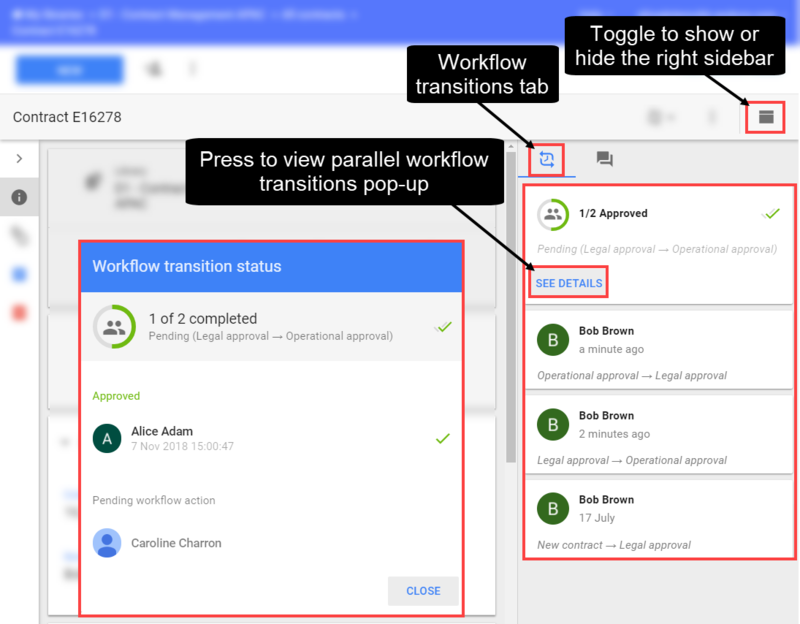 Workflow buttons: If you are a workflow validator, you can perform manual workflow actions. 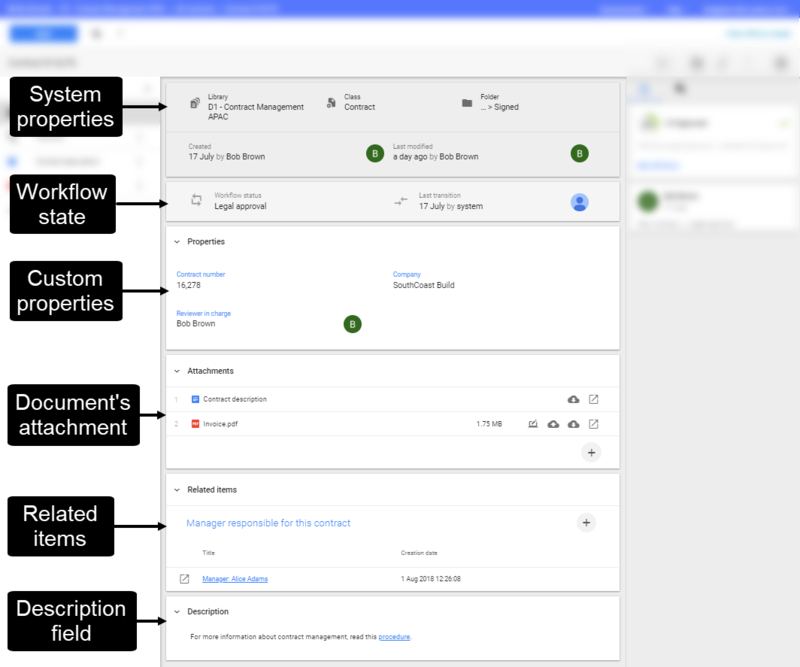 If you are a library administrator, you can force workflow actions. Manage folders: You can move the document from its current location to another folder. The Manage folders option may be available in Document Management libraries, depending on the library configuration. 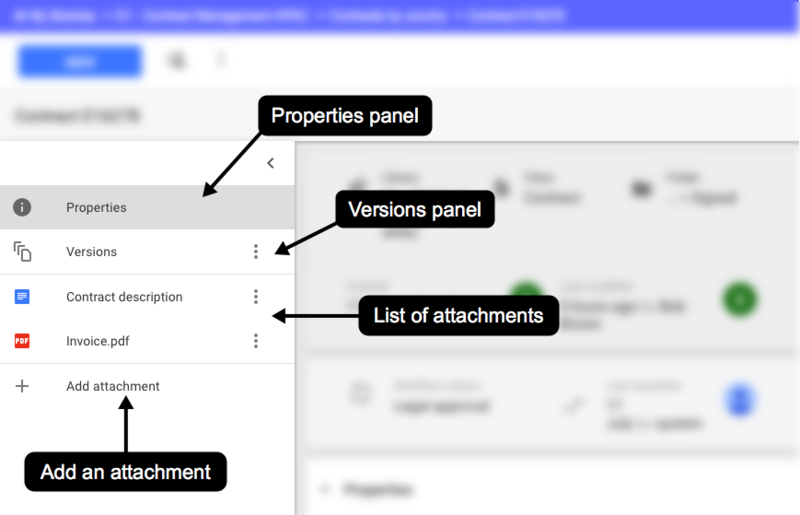 Edit document properties: You can edit the document properties, attachments, relations and description. Toggle to show or hide the right sidebar. Download attachment: You can download the attachment of the document. Administrators can prevent viewers from downloading an attachment. Notify users: You can send an email to users who can access the document. Shareable link: You can share document attachments as Google Drive URLs. Publish to the domain: You can publish the attachment of your document as an embeddable HTML file. Only users from your domain can see the published file. Only Google files can be published. Publish to the web: You can publish the attachment of your document as an embeddable HTML file. Anyone with the link to the published file can see the file. Export: You can export the document to another library or export the document to a user's My Drive. Duplicate: You can copy the AODocs document. The properties, attachments, relations, descriptions and permissions are copied from the original file. Contributors can't copy a document if they aren't document creators of the document class. Delete: You can send the document to the library trash. Administrators can prevent contributors from deleting a document. The document’s system properties: Library, Document Class, Creation Date, Last Modification Date, Document creator and Last Update Author. This section also shows the document's location. The current workflow status (if any) of the document. The custom properties of the document. Note: Custom properties with an empty value are not displayed in view mode. The list of files attached to the document (only in Document Management libraries): You can click the name of a file to open its preview and you can use the action buttons to download it or upload a new version. If the attachment is a Microsoft Office file, you can open the menu next to the file and select Open file in Microsoft Office to open it in Word, Excel or Powerpoint. Learn more: Work with Microsoft Office file attachments. The rich text description of the document. 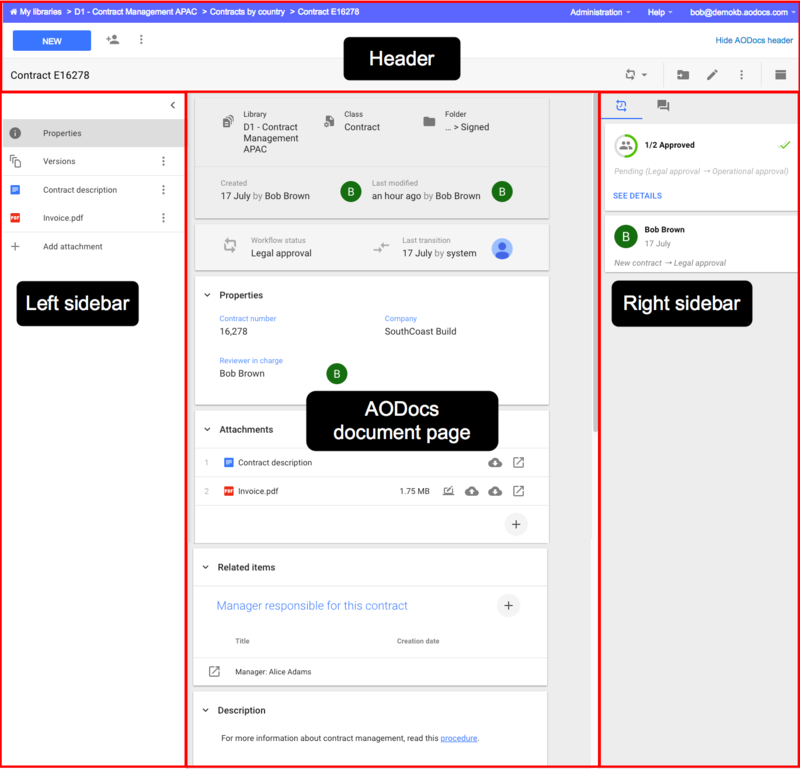 The left sidebar in AODocs documents allows you to access the Properties panel, the Versions panel and the attachments of a document. In Document Management libraries, you can also attach a file to a document from the right sidebar. – Readers can only view document comments. – All users with Can comment permission can add comments. – Only library administrators can delete document comments. – The properties tab is only available when working on an attachment. Learn more: What are attachments? 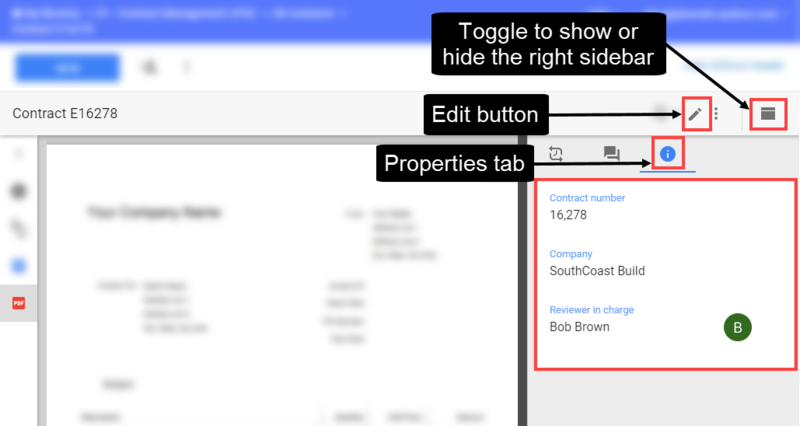 – Readers can only see the properties tab if at least one property value is set. – Contributors and library administrators can always view the properties tab even if no values are set. As a contributor, press the Edit button to change document properties in the right sidebar.